Exchange Server 2013 Cumulative Update 12 does not include updates to Active Directory or additional RBAC changes. However, depending on the version you are upgrading from, it may be required. PrepareAD will run automatically during the first server upgrade if Setup detects this is required and the logged on user has sufficient permission, otherwise, setup will require you to re-run setup with sufficient permissions. Can we expect Office Web Add-Ins with command buttons in the Ribbon to show up in OWA as well? Currently Add-In command buttons are only shown in Outlook 2016. FYI – “%windir%Microsoft.NETFramework64v4.0.30319ngen.exe update” resulted in the error of: The filename, directory name, or volume label syntax is incorrect. When I removed the quotes, it worked for me. i like the .iso way – thanks for that change! Please do this for Exchange 2013 Update too. Unpack .exe – takes several minutes and 2 extra mouse clicks. Exchange team, are you thinking that Exchange admins are retarded and cannot do it? Download extra 5 Gigabytes can take much time on narrow bandwith connection. It’s a shame do it as "new feature"
Supporting Jetze Mellema. Three time bigger ISO-Image is no progress. I’m also don’t like idea about ISO files. Cause usually i copy SFX on EX server and unpack it locally. It took 4 hours on each server to update from Ex2016 RTM to Ex2016 CU1. Usually 1-2 hours (Ex2013 CU installations on same hardware upgrades). %windir%Microsoft.NETFramework64v4.0.30319ngen.exe update – was started before upgrade. mandatory to run PrepareAD if you are upgrading from Exchange 2013 CU11? Executing PrepareAD in large organizations with separate Active Directory and Exchange teams is a very time consuming task. So you do not want to go through the process of doing a PrepareAD if it’s not really needed. http://www.microsoft.com/en-us/download/details.aspx?id=35395 ). Is it really that difficult to make these available for those of us who like to use them ? Will there be an Dutch language pack for Exchange 2016 UM? databases have also the same error, The content indes state is : Unknown!? Is that maybe a bug of E2016 CU1? … by the way, new single copy databases have the same issue! Not only DAG databases! @Eddy1968: I have no issues with search index after upgrade. Try to stop Exchange search services, remove index folder, after services restart it will be re-indexed, it is standard procedure with broken indexes. There was many performance counters errors after upgrade in my environment, but fixed as usual by re-creating them. @Jan J L – There are no RBAC or prepareAD related changes in E2013 CU12. However, you may be required to execute /PrepareAD depending on what you are upgrading from – the last time we required /PrepareAD (enforced in setup code) was in E2013 CU10. – this is much more annoying and a mess, not only for customers but also for the software vendor (downloads, documentation, support..). InfoWorkerMultiMailboxSearchPerformanceCounters.xml is still broken in Exchange 2016 CU1, sadly. Lines 160,164,168,172,176,180,184,188,192,212 still feature a leading space character in front of "Searches", thus causing trouble. c) run: New-PerfCounters -DefinitionFileName "C:Program FilesMicrosoftExchange ServerV15SetupPerfInfoWorkerMultiMailboxSearchPerformanceCounters.xml"
@Alexander Schories – Thanks for reporting the issue, Alexander. I have a question about Exchange counter in Ex2016CU1. After upgrade from RTM to CU1 there were a lot of performance counters errors in applications log. $f = $i.directory, "", $i.name -join ""
I cannot add counter at all. Is it known issue of CU1? do with Exchange 2010 CU1 against these annoying 106 events? standard lines. Practical all other keys are no longer exists (see also new file size if previously larger than 20KB).) Has this seen someone? Anyone knows a solution for it? How can we report it to Microsoft? Is there a published workaround or patch? It is a very grave problem which affects to our customers, sending messages to wrong directions between different customer’s organizations. Thanks in advance for your helping responses. The best way to bring such an issue under Microsoft’s attention is to open a support case. If the issue is caused by a bug you won’t get billed. More importantly, the issue ends up in the database and will become visible for the product team. I realize this is a but cumbersome if you don’t have a support contract or this is the first time you need to purchase support incidents. I wish there was a more easy way to report issues without paying $350 euro upfront to be able to speak to a support engineer. Server have 12 GB of RAM and its using all the RAM. We have the latest updates of Exchange and we are runnig it in Server 2012. ¿ Any advice to help ? Following install of CU1 Outlook 2016 only returns 25 items when searching and Outlook in cached mode. Major bug in this release. Just to notice you that there is a bad HTTP link in the text about “Change to Mailbox Anchoring for Remote PowerShell”: the bad link refers initial mailbox anchoring announcement instead the Ross Smith’s post about the reverted behavior. could you fix this typo in the post ? thank you. Installing Exch2016 in lab, had errors with prepareAD UNTIL we combined FSMO & GC roles on DC. Is this a requirement or just our lab environment? Is it recommended for Exch2016 to have all DC’s as GC’s including FSMO role holder? Applying this EX2016 CU1 broke search in Outlook. Before applying, searching for a term in Outlook showed results, after applying zero hits. ” was run: “System.Management.Automation.ParameterBindingException: Cannot convert ‘System.Object’ to the type ‘Microsoft.Exchange.Configuration.Tasks.VirtualDirectoryIdParameter’ required by parameter ‘Identity’. Specified method is not supported. 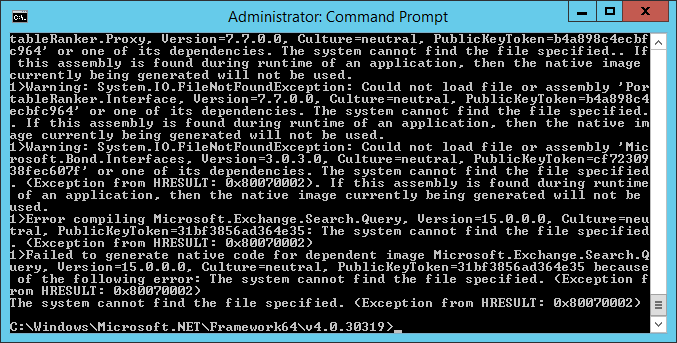 —> System.NotSupportedException: Specified method is not supported. Only after removing the second ActiveSync virtual directory, the CU1 would install. This is not good since we should be able too add a second EAS virtual directory.